Join me for eyeforpharma’s Value Beyond the Pill Summit 2014 and come to my talk on “Build an intrapreneurial ecosystem to ensure your innovative services deliver the value required by patients” at 2:10PM on December 3, 2014. The topics are around delivering patient value and reimburse your services by innovating your business model. A new way of healthcare is here; services are now an essential part of patient care and will help the pharma industry to make a bigger impact as a healthcare provider. Learn how to put successful services in place to gain better access, reduce costs and help your end-user, the patient. Find out what the most innovative and forward-thinking companies are doing to differentiate their brand in the most competitive times pharma have ever faced. The Value Beyond the Pill Summit is held at the Wyndham Philadelphia Historic District Hotel, 400 Arch Street, Philadelphia, PA 19106, USA, on December 3-4, 2014. See the full speaker line up and agenda in the event brochure. Looking into the Abyss – Not kidding! Let me give you an idea how bad it can get. Here is a real-life scenario I was asked at address as a consultant not long ago: A global leadership team identified the need to diversify their management across a distributed, global division. Business results were lagging, bureaucracy stifling and fresh ideas nowhere to be seen let be implemented. Despite an outspoken commitment to Diversity and Inclusion, the ‘corporate immune system’ and ‘group-think’ resisted much needed change with repercussions for those questioning the status quo or thinking differently out loud. Data-driven paralysis by analysis was the daily mode of operation. – You get the picture. As if the situation was not bad enough already, the brightest brains have left or where about to leave. They so drained the ‘leaky pipeline’ of talent even more. Since we know that “talent attracts talent” also the opposite appears quite likely. Thereby, the quality of leadership team overall weakens and entails the nasty downstream effects for the staff and the organization as a whole. Obviously the situation was home-grown, which added a sensitive political dimension the whole situation. The blunt question stuck with me, does the top leaders actually know what talent they need? What are their criteria for ‘talent’ when they search, so you would recognize it when you see it? And, do they have the guts of hiring someone who actually looks at things and truly thinks differently, comes up with unorthodox solutions and possibly has a very different profession background, career path and experiences? Let’s leave this ‘case study’ here and step back to look at the bigger picture. Sadly, there were many hidden assumptions at work that never surfaced or articulated. For example, the steepest careers were made by employees sharing the same professional discipline as their leaders, so the assumption was that only a specific professional background would qualify a candidate. Another ironclad assumption was that talent is hard to find – after all we read about this “war for talent” raging out there, as Steven Hankin of McKinsey coined it so dramatically, right? I respectfully disagree. While it makes sense to hire from the outside for certain purposes such as short-term for specific skills or experience for a project or long-term for the right mindset and development potential, for example, it makes little sense to me to neglect the talent you already have. My take was not that there is a lack of talent but a lack of being able to identifying talent. It seems that talent acquisition and development have eroded from an an art form to a dry and rigid process that -obviously- doesn’t work all that well for this organization. Little attention was paid to talent identification and retention within the organization or mindset and cultural fit of candidates, for example. Internal applicants for open positions were in practice only considered when the already did the job they applied for. How is this supposed to work? Where is the potential for existing staff to develop and seize opportunities? We know little about new hires but we a know a lot about our existing employees. What may look like an advantage for the employee often plays out the other way: This knowledge can induce a bias and limit our employees getting opportunities when we may still see them as ‘corporate infants’ despite many years of tenure; like parents who can be blindsided of their kids growing up and being ready for the challenge that we tend more easily to entrust a stranger with. Take an even closer look: These employees went back to school in parallel to their day job, family, etc. They had proven their tenacity and commitment to develop personally as well as for the company over years – and are denied a chance to apply their new skills. What a waste! No wonder the talent pipeline leaked! Traditionally, talent identification is seen as a top-down process where executives pick employees from their pool based on who they believe has potential. The selected ‘talent’ then receives training, development or career opportunities to prepare them for their future leadership role. This was the model applied leading up to the sad situation of the case study above. It favors a bias of group-think and appointing or hiring people like yourself instead of focusing to find the best person for the job. What if we looked at and selected internal ‘talent’ differently? What if we leveled the playing field to allow any employee to prove themselves and then select talent based on merits? Look closely at your employees who went back to school or underwent a significant challenge on top of their core job to learn and develop themselves, such as the ones mentioned above that graduated with advanced degrees in parallel to their day work. This are tough cookies, self-starters, driven to self-improve and seeking career opportunities; ignore them and they will leave. Read also: How to retain talent under the new workplace paradigm? Build a School for Intrapreneurs: Lessons from a FORTUNE Global 500 company as a merit-based pipeline for leaders, talent and change agents. Our battle-hardened graduates have experienced resistance and found ways to form diverse teams and build supportive networks on their way to implementing their ideas. Seed-fund ideas that meet desirable criteria for disruptive innovation for a proof-of-concept by introducing, for example, Angel Investing within the Company – Insights from an Internal Corporate Venture Capitalist. We have seen colleagues returning with more great ideas after their first one got funded. It works like releasing creative breaks and empowering employees to take charge. Meaningful change is likely to meet resistance within the organization. It takes determination to change established talent management practices. It takes guts to walk the walk despite a general intellectual agreement. Time will tell how the above case study plays out for this particular organization, i.e. if the recommendations made will be adopted – or if this consulting appointment degrades to just a feel-good exercise without consequences, since taking action requires real leadership. Next-generation ERG learn from U.S. Army recruitment! What do Generation Y (GenY) oriented Employee Resource Groups (ERG) share with the military? – More than you expect! A constant supply of active members is the life-blood for any ERG to put plans into action and prevent established activists from burning out. The U.S. Army faces a similar challenge every year: how to attract and recruit the youngest adult generation? Next-generation ERGs listen up: Let the U.S. Army work for you and learn some practical lessons! Everyone knows the U.S. Army. This American icon has been around for well over 230 years! The ‘U.S. Army’ is more than a well-known military force. We recognize it as a brand. 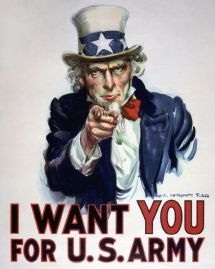 Just like ‘Coca-Cola’ or ‘IBM’ portray and advertise a certain company image to sell its product, the U.S. Army needs to constantly appeal with a unique value proposition for new recruits to enlist. The ‘product’ offered if what the recruit expect to get out of it along the lines of ‘what is in it for me’ (WIIFM). From this commercial perspective, it seems only natural that the U.S. Army hires world-class advertisement agencies to help meeting recruitment targets. 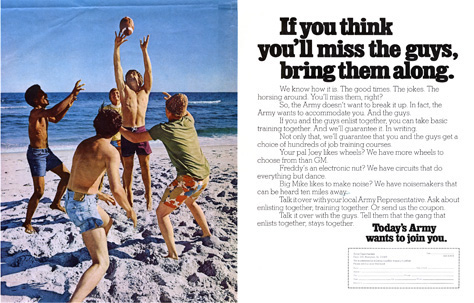 Marketing and advertisement gained importance especially since the U.S. Army turned into an all-volunteer force in 1973. This is similar to a voluntary ERG membership. We distinguish four generations at the workplace today. Each comes with different motivations and characteristics. The collective personality or zeitgeist influences each generation’s behavior and values. These need to be considered to adapt and effectively connect with each generation in its own way to maximize their potential and productivity for the better of the organization overall. You can easily find this spectrum of generations reflected in the historic recruitment campaigns of the U.S. Army. The U.S. Army ‘brand’ changes over time and adapts to appeal and attract fresh recruits. I admit, in practice this campaign hardly affects today’s ERG anymore since most of this age group has already left the workforce by now. Nonetheless, using the ‘propaganda’ flavor in this message proved very successful in both WWI and WWII. ‘Uncle Sam’ captures the essence of a generation of disciplined conformers with much respect for authority and an ingrained understanding that duty to the country is an obligation. The U.S. Army became an all-volunteer force in 1973, which changed the recruiting game entirely. Not being able to rely on a general draft anymore, the U.S. Army needed a new approach to attract a steady stream of voluntary recruits. This coincided with an upcoming new generation of the younger Baby Boomers generally characterized as full of optimism and thirst for social engagement. 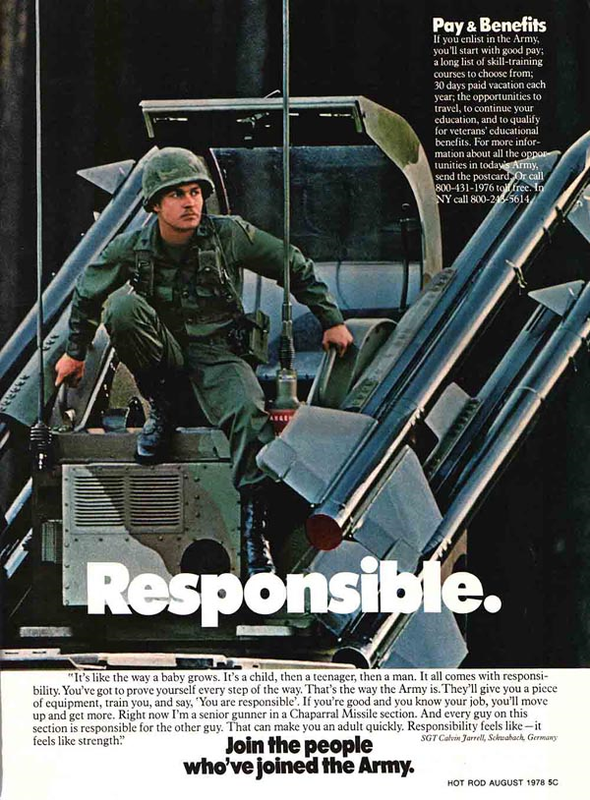 To tackle the new challenge of effective marketing, the U.S. Army brought in a professional advertisement agency. Who expects “Today’s Army” to be a fun crowd playing football? 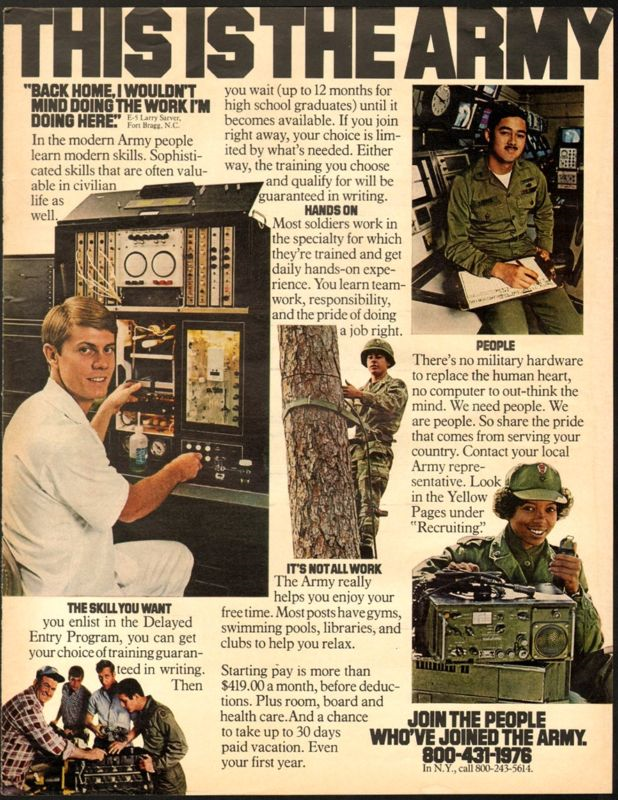 The first ads to the “Today’s Army wants to join you” campaign (1971 to 1980) suggest membership in a nice group of people sharing many similarities. Also, women were now encouraged to enlist. It’s all about optimism, getting together and being involved! This was a gutsy and somewhat liberal first step to attract a volunteer force. Though thinking ‘out-of-the-box’ it did not work out all that smoothly as indicated by changes following quickly. This ad (1973 to 1976) is like a pendulum swinging back to the opposite extreme! Tone and focus changed dramatically in this newer version of “Join the People” emphasizing the seriousness and commitment of being a soldier while also highlighting personal benefits. The message is clear: No more playing around here, responsibility and duty is back, no more football on the beach! Finally, the U.S. Army settled on a more balanced campaign. Here is an example for “This Is the Army” campaign ads. The headlines read “In Europe You’re on Duty 24 Hours a Day, but the Rest of the Time Is Your Own” or “Back home, I wouldn’t mind doing the work I’m doing here” influenced also by a loss of military reputation after the Vietnam war. One campaign or another, the U.S. Army missed its recruitment goal by more than 17.000 in 1979. This announced a new generation, GenX, coming with a different background and values that required the U.S. Army to re-think and find a new approach. Birthrates cut into the recruitment pool. In addition, the smaller Generation X turns out to be tough to target. This generation came with an inherent distrust of authority originating from geopolitical change as well as changes in western society and family structures. Despite GenX’s dominant drive for independence and self-reliance, this generation is also looking for structure and direction in life. 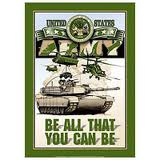 “Be All You Can Be” (1980 to 2001) emphasizes a personal challenge and an opportunity for self-development, i.e. taking charge of your fate to become a better individual. Note that the “we” is gone, it’s all about “me” for GenX. The succeeding “Army of One” campaign (2001 to 2006) hits the true core of the independent GenX by underlining the single person in their message. However, the campaign was also short-lived because a focus on the independent individual appeared contrary to the idea of teamwork that any military organization relies on and cannot work without. Facing demographic decline, recruiting advertisement reached out into Spanish-speaking ‘markets’ (in a campaign known as “Yo Soy el Army”) to tap into the increasing Hispanic population. The U.S. Army made more use of TV advertisement to reach GenX, a generation brought up in front of a TV. Perhaps the boldest recruitment stunt was the 1986 smash movie “Top Gun” – sponsored by the Pentagon in need of a major image boost. And it worked! 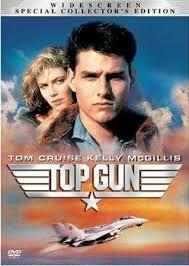 Think about it: Tom Cruise is a self-reliant ace who has a problem with accepting authority – a poster-boy Gen-Xer. In the end, he became a valuable team player for the greater good meeting the military’s needs and got the girl. The ongoing “Army Strong” campaign builds on a proposition of lifelong strength through training, teamwork, shared values and personal experience. – What a change from the previous focus on independence for GenX! “Army Strong” also suggests contemporary leadership, personal empowerment and strength building that found on shared values. Here, ‘strength’ is meant literally: The U.S. Army overhauled the fitness training to ‘toughen up’ this generation. Weakened by a more tranquil lifestyle (such as video-gaming), GenY-ers often lack experience with physical confrontation that is unavoidable and crucial for effective warriors. 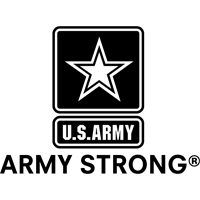 Perhaps confusing for older generations, “Army Strong” caters to GenY’s interest in making a difference not only in their lives but also for their extended communities. Work is less central in this generation while individuality and leisure value high. The campaign milks the social ties deliberately addressing not only recruits but also the people who love and support them, i.e. the people who influence the recruits’ decisions such as family and friends as well as the broader public. 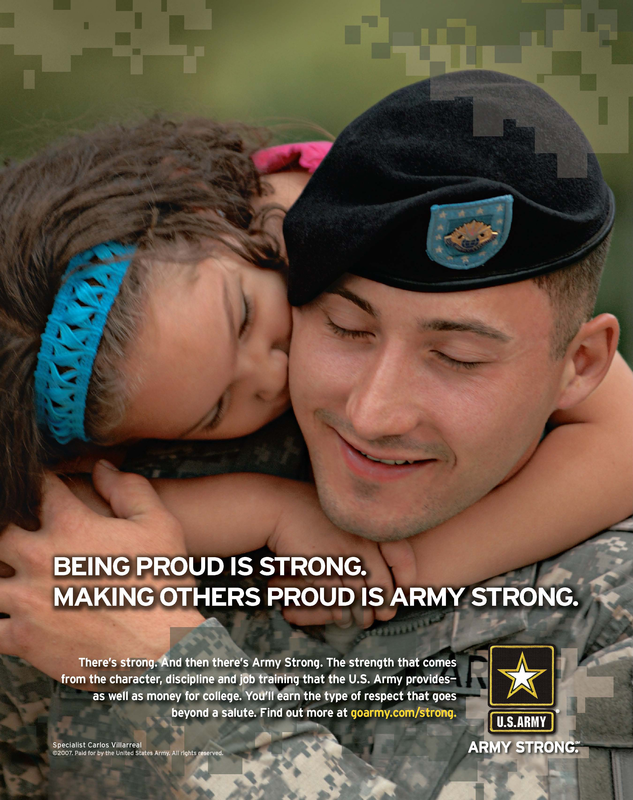 Consequently, the U.S. Army presents itself more as a responsible and somewhat selfless social service in advertisements by highlighting how soldiers serve their communities and for their nation beyond executing force during a conflict. The U.S. Army adapts its spectrum of communication channels to keep up with GenY, a generation for which technology serves as an extension of their personality and their physical selves. Constantly online and connectedness with an appealing adventurous fun-factor, the U.S. Army is present across the entire landscape of noteworthy social media these days – it even entertains its own video game to warm up GenY. Next-generation ERGs and the U.S. Army both aim to attract a specific demographic: The U.S. Army targets 17 to 24-year-old recruits, looking at the lower end, while ERGs typically look for the older end, i.e. young adults with professional training, perhaps a college degree and some work experience. Thus, the U.S. Army’s target demographic starts just a few years younger than the typical employees entering the (civilian) workforce, so the U.S. Army operates a bit ahead of the age curve that becomes relevant for ERG membership recruitment. Let the U.S. Army do your research! Using its marketing dollars, the U.S. Army identifies the characteristics of your future demographics for you – for free! Look at how the U.S. Army is targeting today. It gives you a clear picture of what the characteristics are of your next ERG generation tomorrow. The U.S. Army shares its findings publicly. This includes a sharp outline of the specific characteristics of the youngest employees that enter your workplace now or it in the near future. So, keep an eye on the U.S. Army’s next recruiting campaign and time is on your side! It gets even better. The U.S. Army provides you with field test results on whether their findings hold true in practice: The U.S. Army’s annual recruitment figures serve as a success criterion for the recruiting campaign. These figures are available in the public domain and found easily online within seconds. If the actual Army recruitment figure exceeds or falls short of the target figure (somewhere around 80.000 recruits each year), you get an idea what worked and what did not. The latter reflects not only that the campaign lost effectiveness but may also indicate that the next generation has arrived with a changed set of values and characteristics. – Use this as a free early‑warning system for your ERG! Note that over the past five years the U.S. Army’s number of “accessions” (=recruits) exceeded the “mission” (=target value); note though that the “mission” bar was lowered in 2009 and 2010. When the U.S. Army misses its recruitment target in the future, the next campaign is just around the corner. A significant change in the core message targets the next generation. So, here comes your next lesson and opportunity for the ERGs! If the U.S. Army is not for you, don’t worry. Choose any military branch of your liking – they all face the same challenge. You don’t need to love the military to learn from it, and the lessons are valuable. As a general yet effective approach to strategic innovation, keep an eye on industries and organizations that face similar challenges earlier than you do. Learn from them and prepare your business and ERG for the change. Author Stephan KlaschkaPosted on April 12, 2011 May 1, 2018 Categories Affinity Groups, Generations, InnovationTags Army, business strategy, ERG, GenY, Military, recruitment, strategic innovation, strategy, talent, United States, United States Army, US Army, workforce3 Comments on Next-generation ERG learn from U.S. Army recruitment! An alternative and sustainable way to tap deep into your employees’ creative potential and turning it into solid business value is by forming an employee resource group (ERG). A well-crafted ERG serves as a powerful and strategic innovation engine for your organization! It is the large companies that seem to struggle with innovation most. When companies grow they tend to become less innovative. When this happens we see great talent turning into under-performing employees. – Why is that and is there a way out? Stuck in mental models of the past? Remember the heavy dinosaurs that finally got stuck in the pre-history tar pits and starved, too heavy to move themselves out of the calamity? Mental models are the tar pits that companies grow to get stuck in – unless they find a way to shed (mental) weight and think nimble again to survive. > For more general insight on complexity as a leadership challenge, read this: ‘Complexity’ is the 2015 challenge! – Are leaders prepared for ‘glocal’? This focus on incremental efficiency also traps R&D departments to a point where true creativity and innovation get stifled, the innovative output drops. In short, the larger a company the less it innovates. Sounds familiar? Many companies chose the dangerous and seemingly easy way out in buying new ideas from the outside through acquisitions and hiring ‘new talent’. The danger lays in applying this practice too broadly and becoming reliant on this practice, i.e. getting trapped in a vicious and reinforcing cycle. This practice also alienates and frustrates the more seasoned employees who feel underutilized and –quite rightly so see their career opportunities dwindling. Soon enough the sour side of the hire-for-innovation practice for employees becomes transparent also to the newer employees and drives them away in frustration. This organization just found the perfect recipe to turn top talent into poor performers! Bringing in fresh brains to an organization may justify mergers, acquisitions or hiring at times – but not as a strategy for continuous innovation and without also at least trying to tap into the innovative capacity that lays dormant within the organization. Don’t write your staff off easily by following blindly the common yet wrong assumption that an employee loses the creative spirit after a few years and that new hires would be more innovative than whom we already have working for us. Haven’t we hired the best and brightest consistently in the past? Well, then this logic doesn’t add up, right? Ask yourself: have you lost your innovative edge? Will you personally be more innovative once you change to another employer? – I don’t think so either. The good news is that even if you don’t believe it, changes are that managers and human resource experts of your new employer do, at least the ones who follow the outdated mental model! – But then, how long can you expect to last there before you get written off? It’s like getting on a train to nowhere. But seriously, the seasoned employees’ intimate knowledge of the organization and its people can hold enormous potential for innovation not only under financial considerations but also as a morale booster for staff. Getting personally involved more and engaging them in driving change again actively leads the way to measurable and favorable results for the organization. These employees are the people who know your business, your markets, your customers and where to find resources and short-cuts if needed to get things done! Remember the “Radar” character in M*A*S*H who creatively procured whatever his unit needed by knowing how to play ‘the system’ and navigate the cliffs of bureaucracy on unconventional routes? So, how can you motivate and (re-)activate your employees to come forward with brilliant ideas and getting them implemented to boost the organization’s profitability? How can you spread new hope and direct the enthusiasm to practical and meaningful outcomes for the company and the individual employee alike? The horizontal barrier separates business functions and operating units that evolved to become silos or manager’s ‘fiefdoms’ of sub-optimized local productivity often with lesser concern to the overall performance of the organization. What you are up against here is often enough beyond specialized deep expertise but also defensive egos and managerial status thinking that led to a comfortable and change-adverse local equilibrium. As an intrapreneur you bring a much needed yet disruptive element to the organization. Since you are rocking the boat you can get caught up in ‘politics’ easily. Functional managers and their staff may perceive you as throwing a wrench into their well-oiled and fine-tuned machine that could jeopardize not only their unit’s efficiency but also their personal incentives for keeping operations running smoothly. > For more insight on the tension field of management vs. leadership check out Leadership vs Management? What is wrong with middle management? Another barrier relates to the perceived value that your work creates for the organization, so let’s call it the value barrier: When you start acting intrapreneurial, you may be seen as someone wasting resources, incurring additional cost or generating questionable value (if any value at all) in the eyes of executives and other managers. Therefore it is of critical importance to clearly demonstrate the business value your work adds to the organization. Based on an unambiguous success metrics the value proposition needs to be communicated clearly and frequently especially to executive management to gain their buy-in and active support. These and possibly more barriers are a tough challenge. Now, I assume you are not the almighty ‘Vice President of Really Cool Stuff’ (that would be my favorite future job title!) but hold a somewhat lower rank. Perhaps you got stuck in the wrong department (the one without the Really Cool Stuff). So, where do you start to innovate and ‘rescue’ your organization from a looming train-wreck scenario? A vehicle I tried out quite successfully over the past years was forming an employee resource group (ERG). This grassroots approach has the power to crash right through the vertical, horizontal and value barriers while driving change effectively and sustainably through the organization as a strategic innovation engine. > A previous post discusses the business model behind the ERG approach in more detail: Build ERGs as an innovative business resource! Get organized! Seek voluntary members and reach out to future constituency of the ERG. Active members are needed as the driving force and source of ideas that the ERG turns into business projects aimed to innovate and energize the organization. The first ERG I founded was “NxGen”, which stands for the “Next Generation at the Workplace”. The NxGen ERG has a generational orientation but is open to all employees regardless of their age or workplace generation. Nonetheless, from the start mostly the youngest employees (Generation Y) drove NxGen. In many cases they did not know of each other as the GenY-ers were spread thin across the various business functions of the company.The GenY-ers, in particular, found a forum in the NxGen ERG to get to know each other in the first place. We then focused on goals based on shared values or needs to build a strong support network within the company. At all times we kept the ERG open and inclusive to interested employees join from other workplace generations. The ERG offers its members a safe environment to discuss issues and ideas. It also serves as an informal forum to find coaches and mentors for personal development or specific projects and initiatives. Active ERG membership allows less experienced employees to quickly acquire new skills and test them in real-life by running a project hands-on even in areas outside of their job description or business function to address needs close to their heart with tangible business value. Here, the ERG serves as a very practical leadership development pipeline and safe ground for experimentation within the organization. > More on the virtues of Generation Y as I experience it in NxGen under: Generation Y for managers – better than their reputation? Get active by launching business-focused projects. Again, you are targeting management and executives in particular to build credibility and thereby become more effective over time.Start with feasible projects of high visibility and short duration that address a significant business need with a clear and quantifiable success metrics. For each project seek executive sponsorship at the highest level you can attain from the business area that the project affects. Make sure to communicate your successes broadly and frequently to kick-start the ERG. Stick to a clear, specific and unambiguous metrics for your success; if you can tie it to a monetary ROI the better, as this is the language of business. > More on establishing a success metric under: Driving the ROI – where to start your projects metrics? Showcasing and celebrating your successes as an ERG motivates the already active members, keeps attracting new members and builds credibility among executives to keep the ERG wheels turning as a strategic innovation engine for your organization. The example of the NxGen ERG is very real. NxGen was nationally recognized as best-practices ERG within 5 months (!) of its founding and became a valued and frequent sounding board for C-level executives within one year. The ERG has no funds of its own yet runs projects and initiatives nationally and internationally that already shifted the company culture and opened it more for change.